For backpackers who want to keep finding ways to lose pack-weight, the Klymit Inertia O Zone sleeping pad is a great alternative to sleeping on clumps of pine needles or moss. 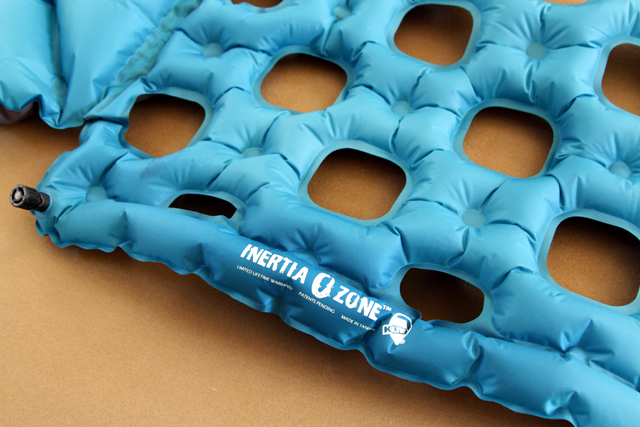 At only 12.5 ounces, the Inertia O Zone is definitely in the category of ultra-light sleeping pads, and the technology used makes it very comfortable. 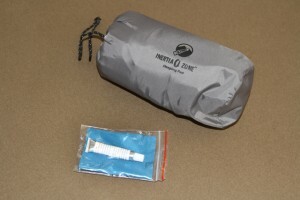 The Klymit Inertia O Zone comes with a stuff sack and field repair kit. The sleeping pad comes rolled up in a stuff sack that is about the size of a 12-ounce soda can. Once you roll out the sleeping pad, you notice it is made up of many air chambers that when inflated, creates a comfortable, yet minimal structure that is designed to allow the insulation of your sleeping bag to create additional small pockets of air that can add to warmth. The sleeping pad is inflated by blowing into the air valve at the top of the pad. Pull up on the valve knob and it opens to fill the pad or to release the air. Push down on the valve knob and turn clockwise to close the valve. On average, it took us anywhere from five to seven big breaths of air to fill the sleeping pad. The Inertia O Zone also features an integrated headrest that is actually very comfortable. It too is inflated by an air valve that took us on average, four to five breaths of air to fill. We liked that the pillow is wider that most, which kept the top of our sleeping bag from slipping off the pillow’s center and the X-chamber in the center of the pad creates a pocket for your head and allows you to slip back into the center of the pillow as you sleep. While the pad works well to provide a good level of comfort, we found it was a little narrow for our “larger-framed” testers. While adding width to the pad would also add to its overall weight, it’s something one can over-look, especially if you like to sleep on your side. 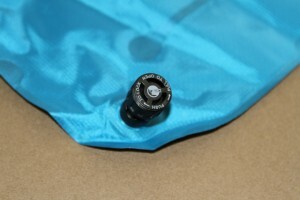 The air valves are easy to use and allow you to quickly fill the sleeping pad. Folding up the Inertia O Zone was a little more difficult than filling it up. Because there are so many chambers, it’s a little more difficult to get ALL the air out before rolling it up tight. We found that sucking out some of the air through the valve helped and folding and rolling it back up from the bottom (foot end) produced the best results to get it back into the stuff sack. 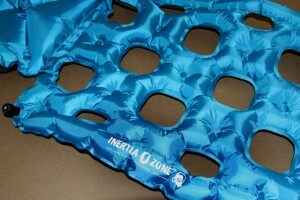 The Inertia O Zone is definitely one of our new favorites for ultra-light sleeping pads. Because it’s a full-length pad that doesn’t take up much space, it works great with a lightweight bivy. We often use a 32-liter pack to go light on an overnight or weekend backpacking trip, and the Inertia O Zone fit great with our other gear in the pack. 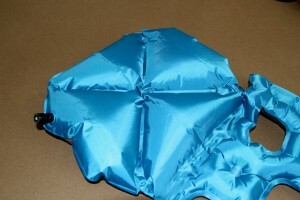 Klymit also manufacturers a lighter sleeping pad, the Inertia X Frame that weights only 10.6 ounces. While we haven’t tested this pad, many of our backpacking friends tell us that the slightly heavier O Zone is definitely more comfortable. The Inertia O Zone retails around $70 and is avaialble at many outdoor retail outlets. For more information, visit www.Klymit.com. The Inertia O Zone features many chambers that make the pad comfortable. We liked that the integrated pillow is large and keeps your head centered.